Being back in the City for me means two things: live music and pizza. In town for a show, I parked the car down in the Village and hopped on an uptown train with plans of first checking out two pizza joints recommended to me by my readers. 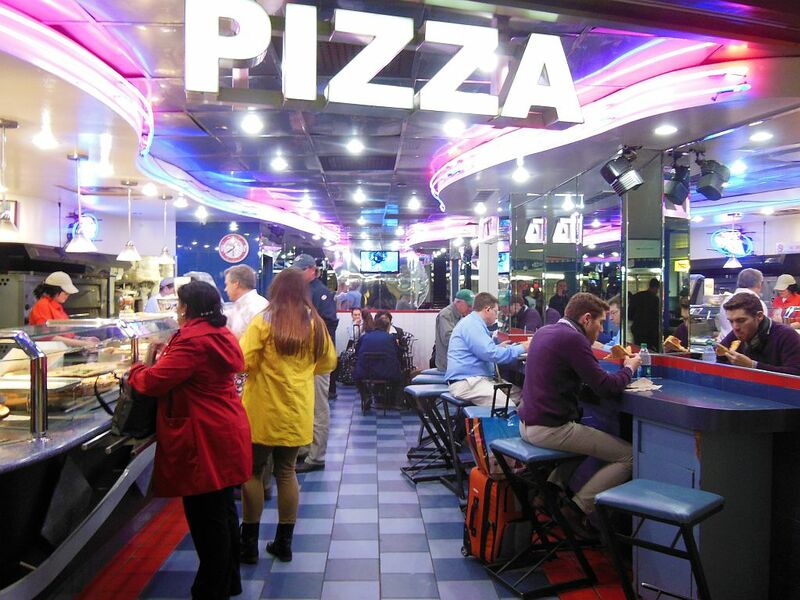 The first was Don Pepi Pizza which is conveniently located in Penn Station, Manhattan’s second largest station behind Grand Central. It had been sometime since I had been to the station common area, and I was quite impressed with its modern look. 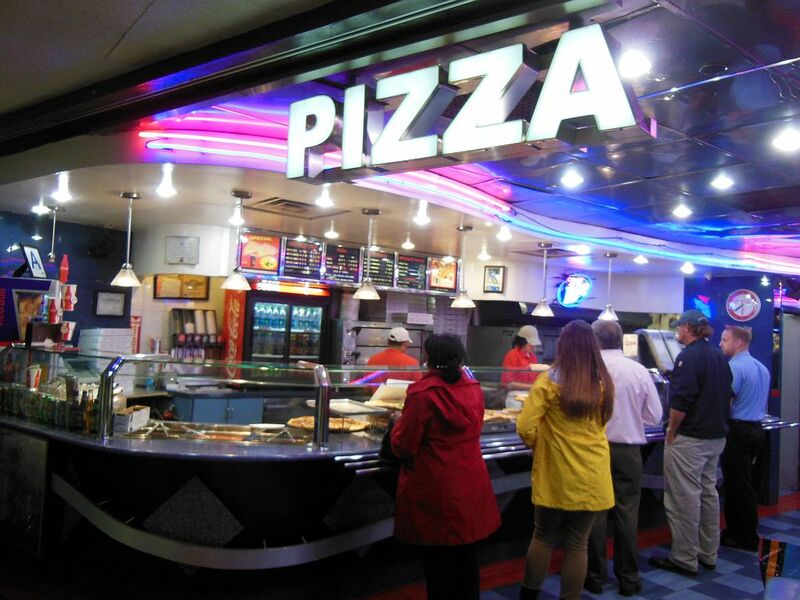 Not finding a directory, I simply wandered through seeing three other pizza places–one other local one called Rosa’s Pizza, a Pizza Hut, and a Sbarro–before I stumbled upon Don Pepi. It was pretty easy to spot with a giant white “PIZZA” sign atop their open facade. Affixed to the side brick wall was a plaque etched with their name and date established (1985). Counter seating and several tables were inside. Despite its menu, this place was obviously about one thing—pizza by the slice! Nearing the end of the weekday rush hour, I got on a short but steady line of commuters looking for a quick, cheap dinner, or perhaps just a snack before they went home. The line took me along the counter where several different types of slices were on display ranging from the basics up to a few complicated specialties. I ordered up a simple plain cheese ($3.00) and a bottle of water ($2.00) and moved slowly in line towards the register. I was surprised that my server did not reheat my slice, and I nervously sensed it getting colder while I waited to pay. My slice looked about as New York as one could be. Everything was in the right size, shape, and mix, exhibiting the perfect crispness. My first bite however, confirmed my suspicions—it was not hot enough! This was an absolute shame for such a beautiful slice of pizza. On the other hand, the lukewarm temperature didn’t hold me back, and it only took a few bites and a matter of seconds before my slice vanished. During its short life span, a few things did get my attention. For one, this slice seemed to be “garlic-centric” in terms of its pre-applied seasoning. I find myself more of an “oregano-centric” guy since I don’t enjoy the lingering garlic aftertaste. Another thing was that the flour dusting on the crust was evident and coated my fingers. 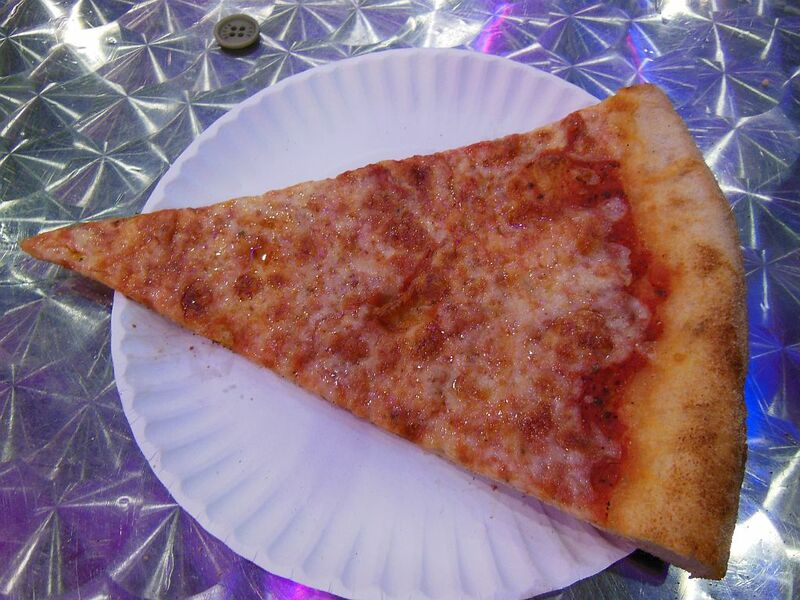 Pepi’s slice, nonetheless, is pretty much another page out of the NY-Style pizza textbook. Despite these minor variations, it is one that those in the know will find hard to pass up when walking through Penn Station. Their failure to reheat this slice was nothing other than a sad logistics breakdown. I hope I “fare” better next time my train brings me through Penn Station.